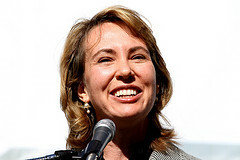 Tag Archive | "federal judge"
On Wednesday, Congresswoman Gabrielle Giffords of Arizona was scheduled to go under the knife for a cranioplasty procedure. This is an extremely crucial step in her treatment for the gunshot wound to her head. Representatives from the congresswoman’s office and officials from the Memorial Hermann Hospital where she is currently receiving treatment and therapy would neither deny nor confirm the report. Her medical team, however, predicted roughly 2 months ago that they are to perform the procedure in mid-May. The hospital spokesperson said they will schedule a press conference today, Thursday. Cranioplasty is a surgical procedure that includes the replacement of a portion of the human skull with either a plastic implant or an original bone tissue. Gifford’s doctors have already said that they will use a synthetic implant that will be secured by titanium screws because the fragment removed from her skull to relive the pressure due to brain swelling was contaminated. If all goes well, cranioplasty usually takes more or less two hours. The congresswoman has been in intense therapy in one of the departments in the Memorial Hermann Hospital, the Institute for Rehabilitation and Research, since the January 8 shooting. Giffords was shot to the head in a public meeting among her constituents in Arizona. Lead suspect for the incident is the 22-year old Jared Loughner who allegedly fired from the crowd. The shooting wounded 13 people and killed six, including a child, a federal judge, and one of the congresswoman’s aids. Giffords’ doctors see a huge amount of improvement on her condition. She was seen dining with her husband and friends a few weeks ago and was cleared to watch her husband, Capt. Mark Kelly, liftoff. Kelly is the crew leader of space shuttle Endeavour. During a preliminary ruling, a federal judge said that bracelets that say “I (heart) boobies!” are not vulgar and should not be barred by school officials who think they are inappropriate. The bracelets are sold to raise funds in support of breast cancer. The ruling went for two Easton girls who were suspended after wearing the “boobies” bracelet after they had been banned in their middle school. The girls wore the bracelet during their school’s Breast Cancer Awareness Day. Judge Mary McLaughlin mentioned in the ruling she issued Tuesday that the bracelets may raise awareness about breast cancer and potentially decrease the stigma associated with breast health discussion. Moreover, she wrote in her ruling that the school district were not able to show that the bracelets could cause a disruption in the school. School officials from Easton insisted that the slogan have sexual double meaning and has pushed two male students from their school touch some girls inappropriately. Easton officials are clearly upset over the ruling as they find it disturbing that the judge could not see what they saw in the slogan. Easton is only one of the couple schools that have banned the bracelet within school premises because of its supposed sexual implication. The bracelets are produced and distributed by a nonprofit organization called Keep A Breast Foundation in California. The organization aims to increase awareness about the importance of breast cancer prevention among the youth. School districts stand that it should be up to them to decide which languages are appropriate to use in school. For now, however, schools in Pennsylvania cannot stop students from wearing the “boobies” bracelet. Taylor Swift’s case with her ex-manager, Dan Dymtrow continues before a federal judge in New York. Dan Dymtrow filed a lawsuit against the Swifts over a contract dispute last 2007 and the case drags on through today. The music manager claims that Swift’s parents owe him millions in commissions since he discovered and built Taylor Swift’s career. Taylor Swift was 14 when she signed a contract with Dymtrow in April. Taylor Swift ended her contract in July 2005. According to Dymtrow, his management made an agreement with Scott and Andrea Swift that he should be paid with 5 to 10 percent commission or more from Taylor’s career in the music industry. However, after introducing Taylor Swift to the industry’s popular names like Scott Borchetta, which is the CEO of Big Machine, they fired him to avoid paying him with the said commission. Both parties have been battling the case in court. Dymtrow’s attorney, Fernando Pinguelo said that Taylor Swift’s parents kept on delaying his client’s commissions until they got rid of him. Paul LiCalsi, Swift’s lawyer said that paying Dymtrow would defeat the entire purpose of the law in New York to protect minors from their signed contracts. The two parties had already submitted their joint letter to the court hoping they will each prove their case.